Prepare the onions: Heat the oil over low heat in a medium pan – add the onions, and fry until golden brown. Place the onions into a food processor and grind to a paste. Wipe the pan clean and set aside. 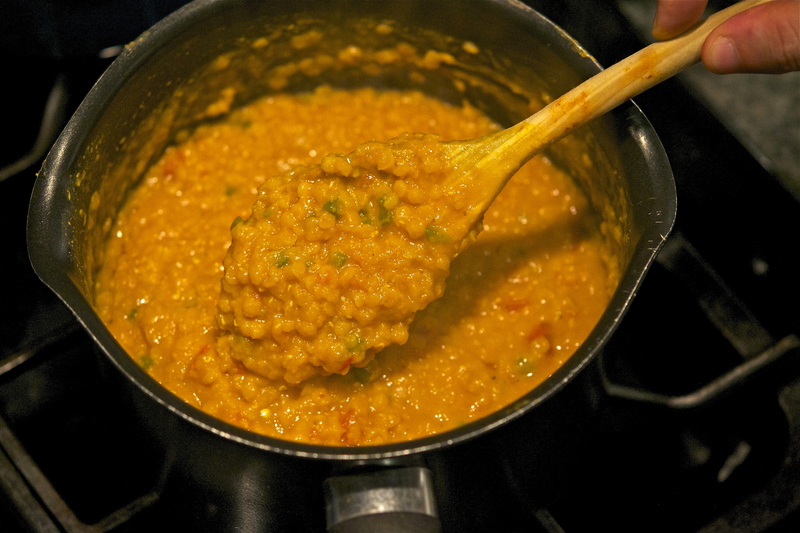 Start the dal: Put the lentils in a heavy-based saucepan with 2 cups of water. Add the tomatoes, coconut milk, chilies, and ground spices – simmer and cook, until the lentils are cooked to a soft mush. This should take about 25 minutes. You can add a touch of hot water if the liquids evaporate before the lentils are done. Prepare the final seasoning: While the dal is simmering, heat oil in the same pan used for the onions over low heat. Add the cumin and mustard seeds, cover and allow the seeds to pop. Pour the toasted spices into the dal, and stir to combine. Season with salt and pepper, and continue to cook for an additional 3 to 4 minutes.